While most of the 2014 corn crop is still in the field, planning for the 2015 crop is underway. Long before the combines start fall harvest, the importance of the 2015 budget will begin to come into focus. The big story in 2015 will be lower commodity prices, especially for corn and soybeans. The question on many producer’s minds is how much, if any, relief might come from lower input prices? A look at 13 years of historic Purdue Crop budgets reveals an interesting trend in corn seed expenses. Overall, the trend of consistently higher seed expenses, per acre, is clear. From 2002 to 2007, expenses ranged between $20 and $40 per acre. In 2008, a significant jump occurred taking expenses from $43 per acre to $79 per acre. Since 2008, the upward trend of higher seed costs has continued albeit at a more modest pace until reaching $118 per acre in 2014. Over the thirteen year period, seed expenses increased at an annualized rate of 12.1%. Generally speaking, the 2002 to 2014 time period was very dynamic period for corn production. Commodity prices and input prices both increased dramatically, so it would be somewhat natural to expect corn seed expenses to also increase. In addition, the planted acreage of corn rose dramatically. However, it’s important to consider how corn seed expenses have changed on a relative basis. To accomplish this, corn seed expenses were evaluated as a percentage of total expected revenue. From 2002 to 2006, corn seed expenses accounted for around 10% of total budgeted revenue. As corn prices – and subsequently revenue per acre- increased, seed expenses as a proportion of revenue declined to a low of 7.4% in 2007. By 2009 and 2010, seed expenses relative to expected revenues hit a record 14.1% of expected revenue in both years. From 2010 to 2013, the expense hovered in the range of 11-12% of revenue. In 2014, as corn prices fell and absolute corn seed expenses went up, seed expenses as a proportion of budgeted revenue hit a new record high of 15.7%. Now to 2015. Many would suggest that absolute corn seed expenses are likely to be up slightly, in line with the historic trend, but keep in mind that corn prices are likely to be even lower in 2015 than 2014. Based on current futures markets the estimate would be $3.90 per bushel. At the $3.90 per bushel price level and seed expenses the same as 2014 ($118 per acre), seed costs would amount to 21.3% of total revenue, shattering the most previous record. Given the margin squeeze producers will face, it stands reasonable to question if the trend of upward corn seed expenses is sustainable. 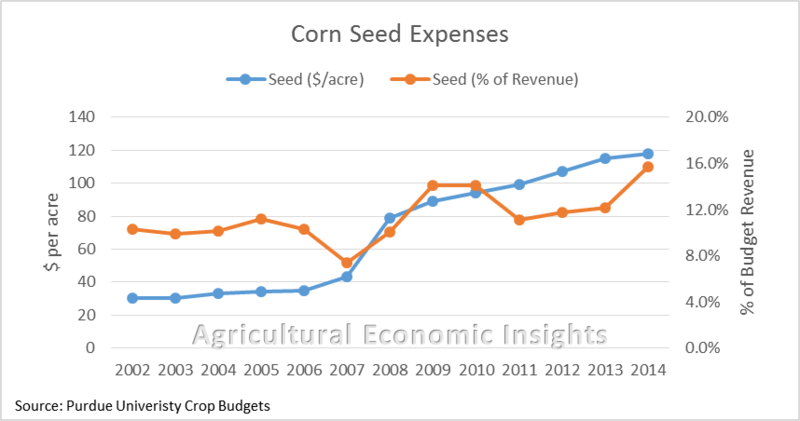 Seed expenses relative to revenue stays the same as 2014: If the relative corn seed expense stays the same as in 2014 – a high point- the absolute expense would be almost $100 per acre, or a 15.4% decline from 2014. Relative prices return to the previous highs: In 2009 and 2010, corn seed expenses were 14.1% of total revenue. This was, at that point, a record high. Returning to those levels would put absolute corn seed expenses at nearly $90 per acre, 24% lower than 2014. A return to 2010-2013 levels: From 2010 to 2013, a fairly consistent range, 11.1% to 12.2%, of corn seed expenses occurred. The mid-point of this range, 11.7%, would place absolute 2015 corn seed expenses at $74 per acre, nearly 37% lower than 2014. Where the trend for seed as a proportion of expected revenue settles out is somewhat uncertain. It is true that the seeds sold today are quite different in terms of genetics and seed treatment options than even those sold just 10 years ago. This would suggest that maybe seed prices expenses won’t fall much going forward. However, it is also true that seed expenses approaching 20% of total expected revenue will make corn a less desirable crop for many producers and with corn a less desirable crop, fewer acres may be planted. Lower seed expenses for farmers can arise through a variety of mechanisms. The most attractive, for producers, is lower prices. Given the competitive nature of the seed industry, significant motivation for a firm, or a group of firms, to lower prices in hopes of capturing market share is likely present. While these firms would be making less revenue per bag of seed sold, the goal of selling more bags may leave them in a better financial position. This would be especially true if planted acreage of corn were to contract rather than expand as has been the most recent case. Beyond lower prices, producers can employ on-farm strategies to lower their farm specific expenses. Switching to less expensive, less sophisticated varieties and reducing seeding rates can also create cost saving opportunities. Further, one might see shifts to other types of commodities putting further pressure on companies to maintain market share. In summary, seed expenses reached record levels in 2014. Given the outlook of even lower corn prices in 2015, the long-standing trend for higher absolute seed expenses seems to be at a point where it may face significant challenges. The environment is ripe for competitors to cut prices in hopes of gaining market share. In reality, a combination of lower prices and changes to producer hybrid selection, seed treatment options, and seeding rates are likely to help producer create some cost saving advantages. Even with these savings we would still not be surprised to see seed expenses as a proportion of expected revenue hit a new record in 2015. Click here to sign-up to receive updates from AEI.